One beautiful spring day in the woods there stood a den with three bears. One was a polar bear named Polo. Another one was a panda bear named Panda and the last one was a grizzly bear named Griz. “Don’t what me. You know what you did,” said Griz. “Sorry,” said Polo. “It is not OK,” said Griz who woke up Panda. “What is all the…. Oh my! Who ate all the food? asked Panda. “I did,” confessed Polo. “Well, we have no money so let’s fish for food,” suggested Griz. Panda and Polo agreed. So they got their old fishing boat, strapped it to the car and took off. They drove through the forest and finally got to the lake. They unstrapped the boat, put it in the lake and put on their life vests. 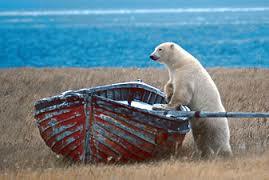 Next, Griz got in and sat in the driver’s seat with a harpoon next to him and the other two got in the boat. Then Griz, Panda and Polo took off. When Polo’s fishing rod started bobbing, he screamed, “I got a biter!” Panda started to clap as Polo reeled it in the boat.It was a boot! “WHAT?” asked all the bears but then Polo, Griz and Panda screamed, “FISH!” They looked inside the boot and there lay a fish. “Dig in,” said Polo and they all ate the fish reward. Their starvation had ended. This entry was posted in 2015/16 School Year, Mrs. Wright's Class, Second Grade. Bookmark the permalink. I liked that when they were fishing Polo got a boot!